= DLPT (Inugo nouryoku shiken) ikkyuu goukaku shitayo. = Hey, I passed DLPT (Dog Language Proficiency Test) Level 1. = You look so proud. I am in charge of the first lesson of the year. First of all, I have a big announcement to make. I passed DLPT (Dog Language Proficiency Test 🐶) N1! It is more difficult than JLPT test. I bet none of you could pass it. No offense. = Kanojo wa samishige/sabishige/ datta. = Kanojo wa samishige ni / sabishige ni doa no sotoni tatte ita. = She looked lonely standing at the door. It is similar to ～そう ( = sou) but compared to ～そう ( = sou) , ～げ（ = ge) has more restrictions and you can’t use it with all the adjectives / verbs / nouns. Note: You sometimes use げ ( = ge) to describe the atmosphere or state. 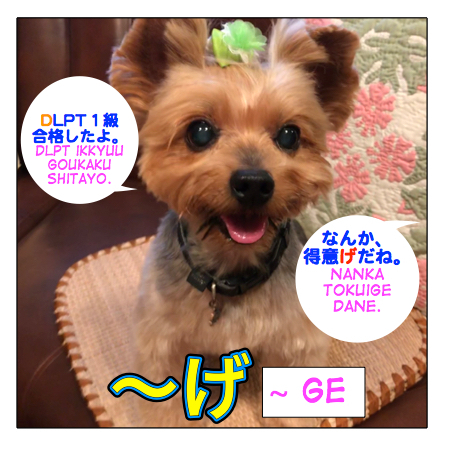 I will teach you the typical expressions with ～げ（ = ge). = Kodomotachi wa tanoshige ni yuki no naka wo hashirimawatte ita. = It looked like children enjoyed running around the snow. = Kanojo ni kawaiine tte ittara ureshige ni waratte ita. = When I told her she was cute, she looked pleased and laughed. = Sono ko wa hazukashige ni watashi no hou wo chirachira mite ita. = The kid was peeking at me bashfully. ＝ Hazukashige mo naku yoku sonna koto ga ieru ne. = Shame on you! How dare you to say such a thing. = Kanojo no kanashigena kao wo mitara nanimo ienakatta. = Once I saw her sad face, I couldn’t say anything. = Hitori de kaigai ni iku to ittara haha wa shinpaige datta. = When I told my mother that I would go abroad by myself, she looked worried. = Kare wa suzushigena kao wo shite uso wo tsuku. = He lies with straight face. = Suzushigena sukaato dane. Doko de katta no? = That skirts looks cool and airy. Where did you buy it? = Imouto no kuruma ni nosete moratta ga abunagena unten de hiyahiya shita. = My little sister gave me a ride but her dangerous/bad driving made me nervous. = Ashita kara Hokkaidou ni iku to ittara minna urayamashigena kao wo shite ita. = Everybody looked jealous when I told them that I would go to Hokkaido tomorrow. =Tomodachi ni ayashigena mise ni tsurete ikareta. = My friend took me a sketchy store. = Chichi wa mukashi no shashin wo natsukashige ni mite ita. = My father was looking at the pictures wistfully. = He made a poor excuse. = Ima wa, hakanagena joshi ga moterun datte. = I heard vulnerable girls has been more attractive lately. = Kare wa nemutagena koe de ohayou to itta. = He said good morning with a sleepy voice. = Maggie wa seikaku ga yosage na inu dane. = It seems like Maggie is a good natured dog. = Ani wa atarashii kuruma wo jimange ni miseta. = My big brother showed off his new car. = Okyakusan wa ryouri nimo saabisu nimo manzokuge datta. = The customers looked very happy with the food and also the service. = Fuyuyasumi ni dokoni mo tsurete ikanakatta node kodomotachi wa fumangena yousu datta. = Our children looked unhappy because we didn’t take them anywhere during the winter vacation. With verbs/nouns: Compared to adjectives, it is much more limited to use げ ( = ge) with verbs and nous. = Kanojo kara imi arigena mijikai messeiji ga kita. = I got a short message from her that seems to be implying something. = Kitto watashi no koto suki ni shite miseru! = I’ll make him like me for sure. = Zuibun, jishin arige dane. = You look very confident. = Kare wo eiga ni sasotta kedo, nanka kyoumi nasage datta. = I asked him out to go see a movie but he didn’t show any interest. = Ano tenchou, tayori nasage dakedo daijyoubu? = The shop manager looks undependable. I wonder if he’s OK? = Kare wa damatte kaettaga nanika iitage datta. = He left without saying anything but it seemed like he wanted to say something. I said you don’t use ～げ ( = ge) for yourself but you can use it to describe yourself. = Shishoku koonaa wo monohoshigena kao wo shite mite itara karaage hitotsu moracchatta. = I was in the sample food section with hungry looking face and got a sample fried chicken. = Joushi ni otonagenai taido wo totte shimatta. = I took an immature attitude with my boss. = Watashi wa NLPT (Nekogo nouryoku shiken) no gokyuu wo sankai mo ochite akiramemashita. = I failed NLPT (Cat Language Proficiency Test) Level 5 three times and gave up. My supporters on Patreon can access an audio file for this lesson on my Patreon page and some mini lessons and quiz. Could you tell me the difference between ge and ppoi? 大人っぽい means “mature” someone/something looks mature. OH GOD YOU’RE A LIFE SAVIOR! May I use げ for writing also? A thousand of loves to Maggie sensei. I made some sentences with げ by myself. Could you help me to check if I am wrong? (2) Mom told me “Everything is OK” happily but her eyes told me differently. If you say 別のこと, it means some other thing. Thank you for this great lesson. Is 何気ない顔 means a face look likes nothing happens. The translation of 何気ない changes depending on the context but 何気ない顔 means “nonchalant face”. So while we can’t use 寒げ to say it looks cold outside, can we still use it for emotion/feelings? Perhaps it should be 冷たげ instead? Or in this case are we restricted to using ～そう only? But whichever I use it sounds like she’s feeling cold instead of seeming indifferent. Maybe I’m using the wrong adjective. Sorry to make you confused. What I meant was “You can’t use it with all the adjectives / verbs / nouns.” Only certain adjectives / verbs / nouns and I showed you the common ones in this lesson. you say 冷たげ or 冷たそう　for one’s personality. I knew tokuige before and was a bit puzzled so this explains everything. Thank you! In the example for urayamashige is the kanji for ittara a typo?